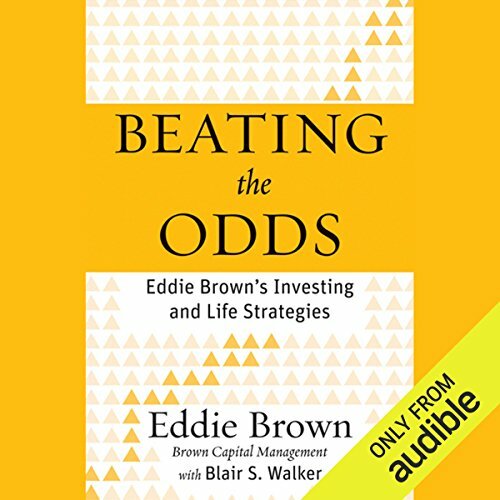 Beating the Odds is the improbable, inspiring autobiography of financial guru Eddie C. Brown, one of the nation's top stock pickers and money managers. It details how Brown skillfully kept Brown Capital Management afloat through the dot-com bust, 9/11, and the Great Recession. Born to a 13-year-old unwed mother in the rural South, this African-American investment whiz created a Baltimore-based financial firm that amassed more than $6 Billion under management. Brown delves into the profound heartbreak and disorientation upon the death of his beloved grandmother who was his surrogate mother - and recounts how Brown's moonshine-running Uncle Jake subsequently became the dominant adult figure in Brown's life. His unflinchingly honest, easy-to-read memoir details how intellectual curiosity, abiding self-belief, hard work and divine providence helped Brown earn an electrical engineering degree, become an Army officer, and later a civilian IBM engineer. Readers will learn of the strife that ensued when Brown quit IBM to earn an MBA, leading to investment jobs that prepared him to start his own money management company in 1983. ©2011 Eddie Brown (P)2012 Audible, Inc.
Great story about the life of Eddie C. Brown. Loved his life story and understanding his mindset. Would have liked to hear more about his investment strategy, but we got an overview. answer young African-American man listening to mr. Eddie Brown talk about his successes inspires me to do well. I am currently working on a master's degree in finance and I'm hoping to walk in the finance field and Blaze the trail just like mr. Eddie Brown. amazing, captivating story of the American dream! couldn't stop listening, awesome story! a great perspective on an American Life. truly great story. Great book! An American success story. I highly recommend this book to anyone wondering whether they can make their dreams and desires come true. Great book with sound advice. Will recommend this to everyone I know who is looking for a great biography.